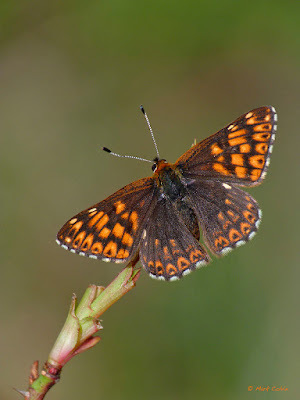 After delivering a butterfly identification and recording workshop for the South Downs Volunteer Ranger Service (VRS), held at the National Park Authority's offices in Midhurst (20.5.16), a large group of us headed to Heyshott Escarpment, to put theory into practice. I was assisted by Jayne Chapman (BC Hants Reserves Officer) and BC/VRS stalwart Arthur Greenwood. As always, Heyshott risked giving an entirely false impression of the plight facing some of our rarer and more localised species. 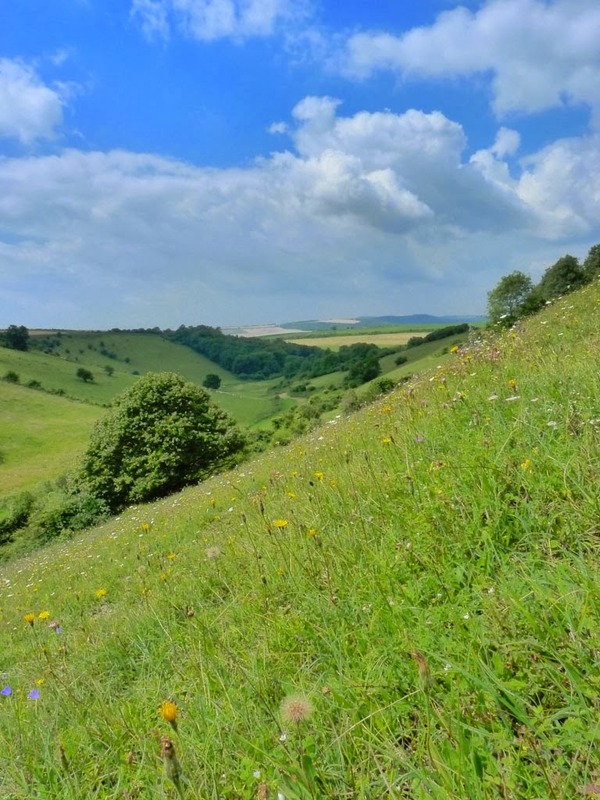 If one were to live entirely within the confines of the Murray Downland Trust's flagship reserve, it would be easy to think that all was well with the natural world. At one point I became genuinely concerned that people might tread on some of the Duke of Burgundies scattered liberally over the ground. It came as a relief to occasionally find a more common species on which the group could hone its identification skills, but for much of the time it was “Duke of Burgundy, Duke of Burgundy, Duke of Burgundy, Duke of Burgundy”. Having recently made an accurate count of 135 Dukes here (almost exclusively males - 129), and knowing the numbers usually encountered within each pit, it soon became obvious to me that I was looking at a larger population than I've ever experienced before. After our group had departed I returned to make a more accurate assessment, but time only allowed a rapid one-hour count over about one-third of the productive area. Females were out in abundance today and I saw a total of five pairings without having to search very thoroughly. I also came across only my second ever example of the pale aberrant form leucodes (it looks rather like a very faded specimen but isn't!). 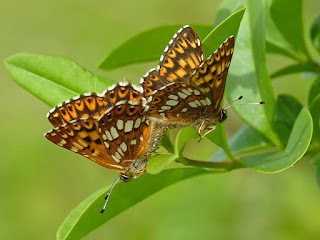 It's been a very good season for aberrant Sussex Dukes, as I've had the pleasure of sharing two specimens of the rare ab. albomaculata (one including traits of the less remarkable ab. gracilens) with a few friends on another site. Over some parts of the reserve which seldom support more than one or two Dukes, today there were many. At times the air was full of butterflies, with males chasing males, males chasing females, and males chasing Dingy Skippers and Green Hairstreaks. In several places I counted the number of individuals sitting within an imaginary one metre square, which reached eight in the most favoured hollow (5m, 3f), during a cool, dull spell. The last species I saw in comparable densities was the African Grass Blue in Furteventura. Even at 4.30 pm, males were descending on recently unfurled wings from the steep back-wall at the top of the reserve. So how many Dukes were flying over Heyshott Escarpment today? 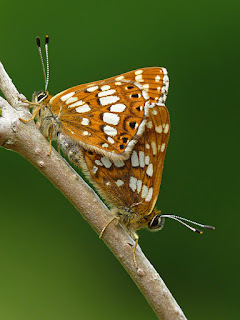 I generally prefer not to estimate or extrapolate, but it is important to record, even imprecisely, the unprecedented recovery of the Duke of Burgundy, on a site where it had come so perilously close to extinction. Today there were at least 200 Dukes on these remarkable slopes. Everyone who has played a part in the conservation work at this Murray Downland Trust reserve should feel very proud of what has been achieved here. I would like to think that the late Betty Murray (http://murraydownlandtrust.blogspot.co.uk/2013/11/dedication.html) is looking down on proceedings with an approving eye.